Konrad Aderer and Farouk Abdel-Muhti. Konrad Aderer’s documentary “Enemy Alien” will be screened on Saturday, Sept. 8, from 2 to 4 p.m. at the Japanese American National Museum, 369 E. First St. in Little Tokyo. 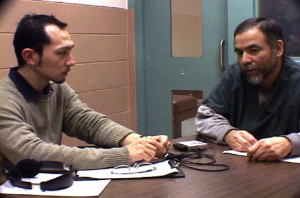 “Enemy Alien” begins with the quest of a Japanese American filmmaker to document the underside of the patriotic fervor comparing the attacks of Sept. 11, 2001 and Pearl Harbor: the post-9/11 detentions of Muslims and internment of Japanese Americans. Finding these aftermaths to be not only historically resonant but linked by immigration policy, Aderer soon finds his own life transformed by this theme as he becomes involved in the fight to free immigration detainee Farouk Abdel-Muhti. Like thousands of other detainees taken from Muslim immigrant communities, Abdel-Muhti is not charged with any crime, but the government goes to great lengths to link him with terrorism. A Spanish-speaking Palestinian who arrived in New York City in the early 1970s, he has become well known as a human rights advocate adept at building bridges between diverse communities. The activists who rise to his defense see a repressive political agenda behind the arrest of a Palestinian unafraid to speak out in the wake of 9/11. Even in his institutional green uniform, in a cramped prison visiting room, Abdel-Muhti gives off a gentle but indomitable charisma. No self-pity or fear is evident in his lively retelling of his arrest, interrogation and beating by the federal agents who tried to coerce him into naming other Palestinian activists. His idealistic vigor in these dire conditions makes a deep impression. Unprompted, he invokes the internment of Japanese Americans as a parallel for post-9/11 detentions, all but shaming Aderer into confronting his own family history. Asking his grandmother about her World War II internment for the first time, Aderer begins to claim his generational legacy: the betrayal and helplessness of the “enemy alien.” What truly inspires him, however, is the political consciousness emerging in the acts of resistance, large and small, by those incarcerated: the refusal of many to submit to the “loyalty questionnaire,” and his own grandfather’s defiance of the ban on photography, illuminating a personal history the government tried to make invisible. But resistance brings consequences: after organizing a hunger strike with his fellow detainees, Abdel-Muhti is locked in indefinite solitary confinement. The government develops as a shadowy but palpable adversary, denying access to him and arresting his son Tarek in a counterterrorism investigation of the documentary itself. In a landmark legal case, the Center for Constitutional rights takes on the fundamental injustice of Abdel-Muhti’s detention. He is held solely on the basis of a deportation order, but as a stateless Palestinian, he is undeportable. The clash of state and citizen is ultimately resolved in a jubilant victory, followed by searing but ennobling tragedy. “Enemy Alien” breaks vital new ground in the ongoing public conversation about the human rights of immigrants and refugees. This compelling real-life dramatic narrative offers an enriching update to documentaries on the World War II internment encompassing issues of detention, confinement, immigrant and refugee rights, and vital insights on grassroots organizing. In an era when immigration policy is dominated by agendas of militarization and enforcement, this film can bring trans-generational, diverse communities together in vital education, discussion and social action. Co-sponsored by Council on American-Islamic Relations (CAIR), Greater Los Angeles Area. CAIR’s mission is to enhance understanding of Islam, encourage dialogue, protect civil liberties, empower American Muslims, and build coalitions that promote justice and mutual understanding. Q&A with the filmmaker will follow the screening. For more information on the museum, call (213) 625-0414 or visit www.janm.org. For more information on the film, visit http://lifeorliberty.org.